The CCI Dashboard is an information panel which allows you to have a global market vision through a Commodity Channel Index. CCI Dashboard analyzes and tracks all the actives you want to invest in. Take advantage of this useful dashboard where you can open in a few seconds the chart and quickly invest on it. Graphic panel that allows you to know the situation of many assets. 7 Different Commodity Channel Index situations to discover when an asset is overbought or oversold. Alerts, mails and notifications that enables the possibility to look for new market opportunities. Commodity Channel Index inputs are 100% customizable. You can also select if you want the calculation to be done when the candle has closed or you want to be done with the current candle. The colors and alert messages of the indicator, are represented by the image “Colors and Alerts”. All alerts will notify you of the situation once per candle. 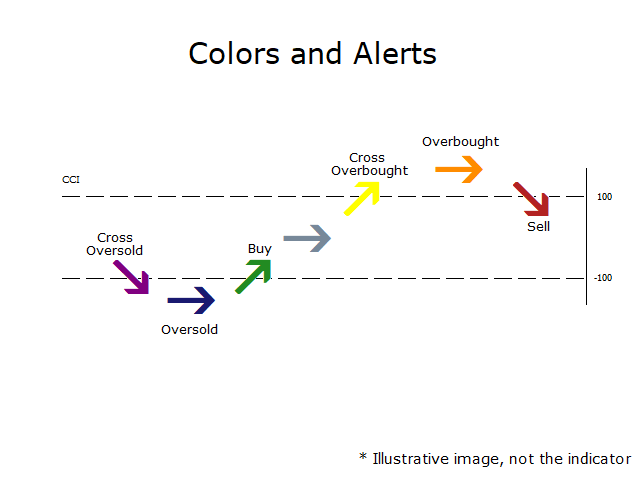 If the overbought or oversold signals are activated, alerts will be sent while the indicator is in that zone. The demo version is limited to a single asset because of the limitations of the strategy tester. Display Indicator Data – Activate or deactivate the lateral information relative to Commodity Channel Index and its configuration.